I spent the evening watching a custom loudspeaker being built at Toby Speakers which included some of the beginning work on the crossover network. In the process, the term “Zobel filter” came up and after reading about it, I realized what important the concept actually is to speaker design. I’m surprised I’ve never come across it before. Zobel networks are a type of filter section based on the image-impedance design principle. They are named after Otto Zobel of Bell Labs, who published a much-referenced paper on image filters in 1923. The distinguishing feature of Zobel networks is that the input impedance is fixed in the design independently of the transfer function. This characteristic is achieved at the expense of a much higher component count compared to other types of filter sections. The impedance would normally be specified to be constant and purely resistive. For this reason, they are also known as constant resistance networks. However, any impedance achievable with discrete components is possible. A Boucherot cell (or Zobel network) is an electronic filter, used in audio amplifiers to damp high frequency oscillations that might occur in the absence of loads at high frequencies. Named after Paul Boucherot a Boucherot cell typically consists of a resistor and capacitor in series, that is usually placed across a load, for stability. It is commonly seen in analog power amplifiers at the output of the driver stage, just before the output inductor. The speaker coil inductance of a loudspeaker generates a rising impedance which is worsened by the output inductor generally found in analog power amplifiers; the cell is used to limit this impedance. The documentation for some power operation amplifiers suggests the use of a “Boucherot cell between outputs and ground or across the load”. Additionally, Boucherot cells are sometimes used across the bass driver (and mid-range) of a speaker system, in order to maintain a more constant driving point impedance as “seen” by a passive crossover. In this specific arrangement, the Boucherot cell is sometimes also known as a Zobel network. 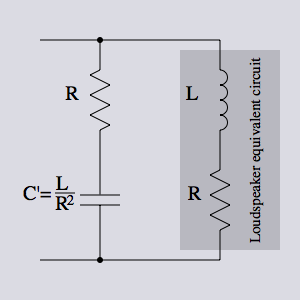 Some loudspeaker crossover designs aim to stabilize impedance at high frequencies by including Zobel networks.